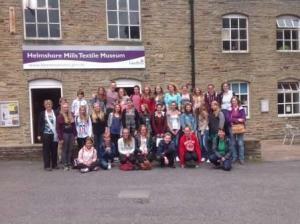 THIRTY-one German students visited Haslingden High School for the eighth school exchange with Bad Aibling School. The students, from Southern Germany, spent a week in the Valley staying with their English partners. Day trips were organised including to the Beatles Museum in Liverpool, Etihad Stadium in Manchester, Castle Museum in York and Helmshore Mills Textile Museum. At the weekend they undertook activities with families including a trip to Blackpool Pleasure Beach, visiting Alton Towers and the Trafford Centre. They were also able to take great delight in watching their country win the World Cup. Haslingden High School students will make a return visit in October.